The classic cut of this Badgley Mischka gown makes sparkling head-to-toe look polished. Accent the sparkle with Kenneth Jay Lane's Polished Crystal Drop Earrings,and Cara Accessories Gold Dress Me Up Bracelet. Also available in sizes 0-14 and blush. We recommend Hollywood Fashion Tape's Double Sided Fashion Tape. Gold sequins (100% Nylon). Sleeveless. V-neckline. Full skirt with ruched waistband. Hidden back zipper with hook-and-eye closure. Lined. See size and fit tab for lengths. Imported. Beautiful dress and I felt like a million bucks. Did not wear to event but tried it on. Fit was true to size! I originally ordered the 16WL and the 18WL. Unfortunately, the 18 was not available at the last minute, but RTR worked with me to replace it with a different size and/or dress. I wore the 20R and the length was good. It was pretty loose around the bust area, so wearing the size 18 would have been ideal if it was available. I received so many compliments on this dress. 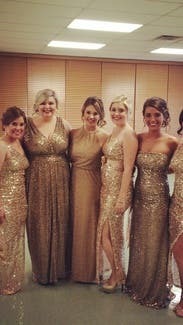 It was a hit at the gatsby themed all gold wedding I was in, and I would definitely rent this dress again!!! HIGHLY RECOMMENDED. This was my first RTR experience and it was great! I received tons of compliments! I used the reviews to order the dress two different sizes but definitely could have worn the size 16. 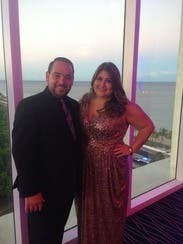 The dress was super comfortable and very flattering! It's very cleavage baring which my husband loved! : ) I felt like I was sparkling and shining all night! I definitely felt special! I wore this for a black tie wedding so it was totally appropriate. The only issue I had with the dress which stopped me from giving it 5 stars is that the straps ran big which caused me to have to use tons of double sided tape to keep the dress in place around the cleavage area. I assume that this would not be a problem if I ordered a couple more sizes down. Overall, very pleased with this one of a kind dress! I had so many complements from complete strangers! I felt like a celebrity in this dress! It's fits great, but I am very large chested and it was still a little big on the top for me! 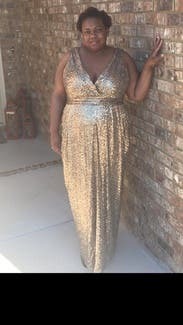 It was perfect for a casino themed Mardi Gras ball, I will definitely be renting this dress again! It makes you so beautiful! Amazing gown, will make you feel like a princess. The top is a little big, the dress was pinned which I left in place. So many compliments, would rent again! Felt so sparkly and comfortable! I wore this to our formal engagement party - FANTASTIC! It fit beautifully! I didn't have to worry about bra straps showing (although I had to make sure I pulled down the back band of my bra so it didn't show over the V in the back). It was the perfect length in 3-4 inch heels, a little long when I switched to flats toward the end of the night. I was worried I might get irritation under my arms from the sequins, but that didn't happen! The dress was so comfortable. Highly recommend! Gorgeous in sequins, but be careful they cut. Beautiful if you can get past that. I will say that this dress was truly beautiful. The downside was the top was really large with a mega plunge. My girls are a 40 DD and this was large on top in the 18WR. I put a couple of pins up the front to lessen the plunge and it seemed to make the top fit nicely. I have a gut issue, in that mine is large, and this dress fit wonderfully in the stomach and didn't show my rolls. :) Another word of caution, the sequins will rub on your arm and I ended up with a few small cuts on my inner bicep. If this will drive you crazy, don't rent this one. I would totally rent this again should the occasion present itself. It really was a showstopper. I LOVED this dress! The top was a little big but I made it work. LOVE THIS DRESS! The dress is gorgeous; almost everyone at the gala I attended came up to me to compliment it. The top was a bit big on me, but with a fuller bra I made this work. It;s definitely worth it. 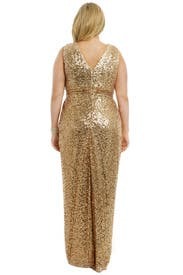 I couldn't wear this dress but it's beautiful gold with forgiving pleats at the waist. Unfortunately it was a little big on me and bigger at the top so that it puckered in the back, showed wqay too lmuch cleavage (I would've had to pin it closed), and had too much room at the straps. That combined with not being crazy about sleeveless dresses showing my arms, it just didn't work but it is a lovely dress. This was incredibly flattering on. This was actually a replacement dress sent to me by the RTR team when my original rental didn't work. It fit beautifully and I was super confident in it. The most beautiful thing I've ever worn, and the most beautiful I have ever felt! Felt like a star! -I'm 5'6 and wore about 3 inch heels and it was still about an inch long, but I ended up not minding. I definitely could've gone with the regular length though. -This is definitely a dress for bustier girls. I had to safety pin about two inches closed because it dropped so low and I didn't have the goods to fill it out. Again, I didn't mind. -I could've definitely gotten a size smaller. It was big in the upper area and didn't hug perfectly around the hips and waist. -With the way the dress was shaped, it draped me nicely even though it was too big. No one could've been able to tell. I loved the style of the dress. -The dress was kind of heavy, but I didn't really notice except when I first put it on due to being distracted with all of the festivities. -I would recommend this dress ten times over and would absolutely wear it again. It was a total show stopper and I have never felt more like a queen! The compliments on my look! SUCH a comfortable dress! Was able to wear my normal bra with it. I had to pin the front as many other had mentioned, but it doesn't impact the look. I was told I looked like a Greek Goddess! I'm 5'8", and got the long, but definitely needed to wear high heels. 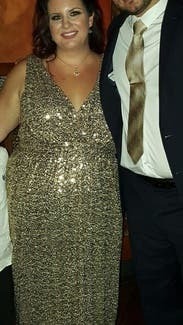 Since I was having trouble deciding, I got the cocktail length version of the same dress, and when the dancing started I switched dresses, and was able to wear flats to dance in. 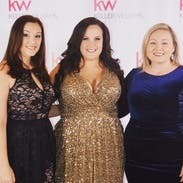 Highly recommend the crystal drop earrings that Rent the Runway recommended-they just upped the overall effect of the dress! This style is so glamorous! I felt like an Old Hollywood movie star! The length does run a little long, so if higher heels are possible, I would suggest those. The deep V in the front is a little intense, but it's nothing that a little fashion tape can't fix. I felt very comfortable in this style and the sequins were not very itchy. If I had a fancy event to wear this to, I definitely would! The dress was beautiful. I received several compliments throughout the night. I ordered a size larger than what I usually wear because the 16 was not available. The 18 as to be expected was a bit large. I used some pins around the bust and on the back and it was hardly detectable. My advise is to order true to size and wear with tall heels. It was a very well liked dress by all the guests. 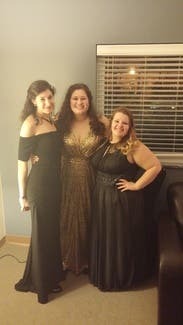 I wore it to a ball my sorority had. It fit true to size. I have a small bust for my size, so it was a little big in the bust. It wasn't a big issue though. Other than that it fit well. I got a regular length and I'm 5'7". I wore flats, and it was barely long enough so I would diffidently recommend a long if you plan on wearing heels. What a beautiful dress! I received a million compliments and was truly "feeling myself" in this. You don't feel like a sequined dress, which usually run tight. This stretches, and has a nice draping fit. It sparkles and shines. My only complaint is that my photographer didn't catch the gold tones as well in the picture and that's totally not the fault of the dress. You'll feel like Old Hollywood, Marilyn Monroe in this dress. I loved how I looked in the dress…I forgot to pay attention to what others thought. 18WR was floor length with 2 inch heels, 16WR went to top of shoes, go figure. Entire process was seamless, easy and FUN! Doing it again with a different dress in a week. This was my first RTR experience. I rented this dress for a black tie NYE wedding. This dress was AMAZING! I was surprised at how comfortable it was. I thought for sure the sequins would dig into my arms all night but not at all. I ordered a 16WR which is my typical size and I would say it was actually a hair too big. This dress is pretty large on top with a deep neckline and I'm small on top so I had to get creative with tape and pins but it worked. I didn't get a back up size because there weren't any more of this style available but if I could have I think it would have been better to go a size down rather than a size up. The dress somehow manages to be very roomy and forgiving while still giving you a shape and flattering your curves. The length was great. I'm 5' 6" and the dress was plenty long. I wore a 2" heel and the dress just barely rose above the floor. Overall this was the perfect dress and I got a ton of compliments. 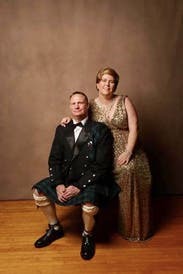 I loved wearing it and wish I had more black tie NYE weddings to attend so I could rent it again and again. This dress is a showstopper! There is no other way to describe it. I lost count of the number of compliments I received about this dress. It was very light and breathable for an all-sequin affair. 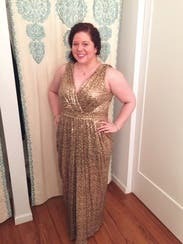 And unlike most sequinned dresses, I found the dress to be very comfortable on my skin while dancing and walking around. The length was perfect as I chose 3" heels to wear. The top was a little large, but a few pins took care of that issue. Overall, I highly recommend this dress! This was the best looking dress ever! Amazing fit and I got tons of compliments! It fit perfectly and hit right above the floor. Amazing! This was a show stopper! 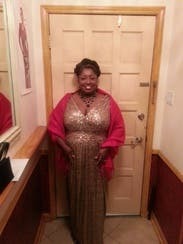 I wore o an Oscars themed Gala and received so many compliments. Overall fit was great. I thought it was a little short for heels and the strap area was a little loose. 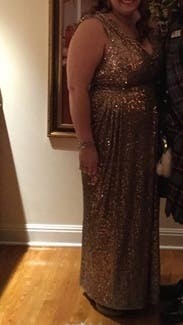 Worn for my company's holiday gala at an iconic ballroom. The compliments never stopped! The dress fit like a glove and was so comfortable! As I am a bustier woman, I was nervous about how it would fit in the top, but it was amazing! Everyone loved it and I got so many compliments! Great fit and very flattering. Sequins do rub the underarm a little. But the dress is incredible! Definitely would rent again.